Last Chance for Juliano Star during 2019! The stallion is registered for Swedish Breeders Crown. A big thanks to all customers who has used his services! Derbywinner and undefeated in 23 wins in a row. Winner of Elitloppet, Olympiatravs-winner and Hugo Åbergs Memorial. E3-elimination winner, third in final. Drottning Silvias Pokal-elimination winner, third in final. Derbysto winner in elimination and final. Breeders Crown semifinal and final-winner. Number 1 ranked older filly in Travronden winter 2010. Derby elimination winner and Derby finalist, Breeders Crown final-winner. Derby elimination winner and fourth in the Derby final. Silverstoet-winner Double Breeders Crown-winner as 2. 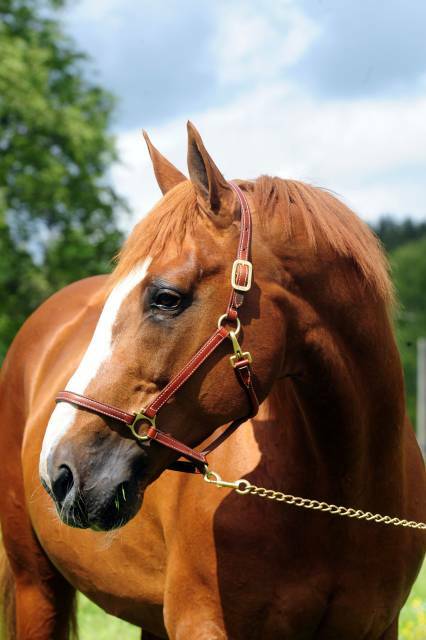 JULIANO STAR opened at stud in Sweden in 2001 and 2002 at Broline and continued his career at Staro in 2003. He has made his fourth, fifth and sixth breeding seasons in France and the book has been full every season, but 2009 where he bred 134 mares. In 2010 the book was full again. Juliano Star's first crop was born in 2002. Juliano Star has had a successful studcareer from the beginning. No less than 11 of his pedigree have earned more than 100 000 Euro showing both early talent and speed. His most renowned Swedish son Commander Crowe rec. 10,1 ak. has earned 9 million SEK with 34 wins. Other successful offspring are Bobtail earning 4 119 838 with 19 wins in 42 races and a record of *11,9ak, D.J. Seabrook winning 22 races of 73 earning 2 912 434 SEK at 12,2 am at his best and the filly Stargirl who won the classic race Derbystoet and has earned 2 005 804 SEK winning 26 % of her races. In the Netherlands Uriah Boko was timed in 1.14,8/1609a in his 2-year-old debut. It is the fastest time ever for a 2-year-old debutant in Europe. Uriah Boko dominated in the Netherlands also as a 3-year-old in 2005. He won 8 of 9 races and earned 68.380 Euro. He won Sweepstakes elimination and final, Derby elimination, Grote Unitrot Prijs and Fokkerstrophy. Father of Juliano Star is the french champion sire Buvetier d´Aunou 1.14 6.075.000 FRF. His dam Nesmile is also the dam of Defi d´Aunou 1.11 and Extreme d´Aunou 1.13. Buvetier d´Aunou is father of the Prix de France-winner 2001, Gobernador 1.12,2m/3,7 million FRF and millionwinners like Ultrason, Ganymède, Genois de Pouline, Grande Lady, Hermes du Buisson, Hello Jo, Install and Ivilla Blue. The dam of Juliano Star, Star Gédé 1.15 was a winner of semi-classique (Prix Marcel Dejean och Prix Pierre Richard). Her father is the champion sire Florestan, who became characteristic of the successful "new breeding" in France with French American blood. Star Gédé has produced five offspring with a record of 1.15 or better. Othello 1.15 (5), 381.625.000 ITL (Quocky Williams), won 29 victories in Italy. Esotico Star 1.15 (3),1.523.750 FRF (Tarass Boulba), winner of six races. Among them are semi-classique Prix Capucines, Prix Kalmia, Prix Paul Karle and second in Criterium des Jeunes. Esotico Star is one of the young popular stallions in France. Gabor Star 1.14 (5), (Buvetier d´Aunou), has ended a promising race-career. He took six victories, a.o Prix de Colmar. Gabor Star is now standing stud. Hezia Star 1.15 (3), (Cezio Josselyn) has taken several victories and is like his brothers at stud in France. Juliano Star made his debut as 2-year-old at racetrack of Laval October the first as second. He took his first victory in forth start when he won Prix Geminus. 2-year-old season ended with third places in races Prix Ourasi and Prix Emmanuel Margouty. Juliano Star earned second most in France as a 2-year-old. He earned 262.500 FRF. Juliano Star was ,without a doubt, the dominating 3-year-old colt in France. During 2000 he won in classic Criterium des Jeunes, Prix Paul Viel, Prix Kalmia, Prix Capucines, Prix Pierre Plazen and was second in Prix Paul Karle. Juliano Star took 3-year-old record 1.14,3m and earned 2.117.500 FRF in 2000. His total sum was 2.380.000 FRF after 3-year-old season. Juliano Star has beaten the best in his brood. His victory in Criterium des Jeunes is very important for a stallion and a proof for the early starters as the last year's stallions are renowned for. Autumn 2001 he won a qualification for the Grand Prix I´U.E.T in Caen. In the lead all the way and ending in 11,4/400 meters, he won at 1.15,2/2100a driven by Jean-Pierre Dubois. In the final of Grand Prix I´U.E.T Juliano Star and Abano As struggled side by side. Juliano Star came in second in this 1,5 millions Franc-race. Juliano Star landed with 12,8/2100a only one tenth from Abano As 12,7 which was new track record. In 2000 he won the classic races Criterium des Jeunes, Prix Paul Viel, Prix Kalmia, Prix Capucines, Prix Pierre Plazen and finished second in Prix Paul Karle. Juliano Star's offspring are nominated for Breeders Crown. Commander Crowe (e. Juliano Star) vinner Breeders Crown för 4-åringar (612.000 SEK) 2007-11-03 1.14,4a/2140. 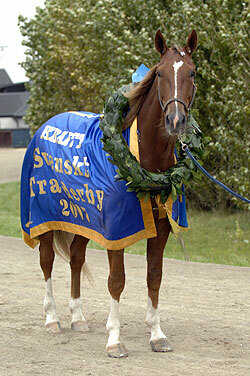 Commander Crowe (e. Juliano Star) vinner Svenskt Trav Derby (1.600.000 SEK) 2007-09-02 1.14,2a/2640. Commander Crowe (e. Juliano Star) vinner Gulddivisionen (150.000 SEK) i Halmstad 2008-07-05 1.12,5a/2144. Commander Crowe (e. Juliano Star) vinner C.L. Müllers Memorial (500.000 SEK) på Jägersro 2009-10-31 1.13,7a/2640. Bobtail (e. Juliano Star) vinner V75 International (500.000 SEK) på Jägersro 2009-10-31 1.14,0a/2140. Bobtail (e. Juliano Star) vinner Derbystoet (500.000 SEK) på Jägersro 2008-09-07 1.13,4a/2140. Bobtail (e. Juliano Star) vinner Breeders Crown för 4-åriga ston (700.000 SEK) på Eskilstuna 2008-11-01 1.14,8a/2140.